How to Fake Flawless Skin-Without Caked On Makeup! As I’m getting a little, ahem, older a lot of the decisions of my younger years are catching up with me. In particular, my habit of baking in the sun while growing up in Virginia Beach is causing some age spots and fine lines to pop up-fun stuff right? I’ve never been a huge fan of heavy makeup so I’ve been on a quest to find makeup that gives enough coverage to even out my skin tone without looking caked on or settling into fine lines. After scouring just about every product and technique out there I’m sharing my tops tips for faking flawless skin today as well as a great giveaway! You can’t get smooth youthful skin if you’re not exfoliating-period. I prefer a gentle exfoliating scrub like my Olay Pro-X Cleansing System and then a weekly gentle peel like this one to keep skin renewed and fresh. How many of us have put on makeup only to go outside and see a giant line of unblended foundation along our jaw line? I actually used to pluck my eyebrows in my car in college because I could never get the lighting good enough inside to do a good job! Why bother applying makeup if it’s just going to wear off in a couple of hours? Primer gives your makeup something to “grip” to and makes it last significantly longer. For long lasting wear I recommend Benefit Stay Flawless Primer or for a budget friendly option, Loreal Magic Lumi Primer, which is what I’ve been using lately. Finding a light feeling foundation with medium coverage has been a HUGE challenge. I was very tempted over the holidays to splurge on Dior Airflash Spray Foundation because of the impeccable reviews it had but I just couldn’t bring myself to spend the money on it. I’m glad I didn’t because I ended up trying Loreal True Match Luminous Foundation and I LOVE IT! It goes on light and you can’t feel it on your skin but it gives a nice medium coverage. Plus you can’t beat the price! Even with the nice medium coverage of the foundation I have some areas that need a little extra help-mostly darkness under my eyes and some unfortunate melasma my second pregnancy graced me with! I tried the Tarte CC Undereye Corrector at my local beauty shop and it worked so amazingly that I had to have it! It somehow miraculously gives full coverage while maintaining a natural texture and feel-it’s my little miracle product! I apply it with a concealer brush only where it’s needed and so far it’s seems like it’s going to last a long time. For regular small blemishes that need coverage my fall back concealer is NYX Full Coverage Concealer for it’s budget price and heavy duty coverage-but it will look heavy if you use too much. Finally, don’t forget to highlight! Just a dab of highlighter along the tops of your cheekbones brings a gorgeous youthful glow to your face-it’s like icing on the cake! I use Benefit High Beam-it’s been my go to favorite for over seven years now and a bottle lasts forever! 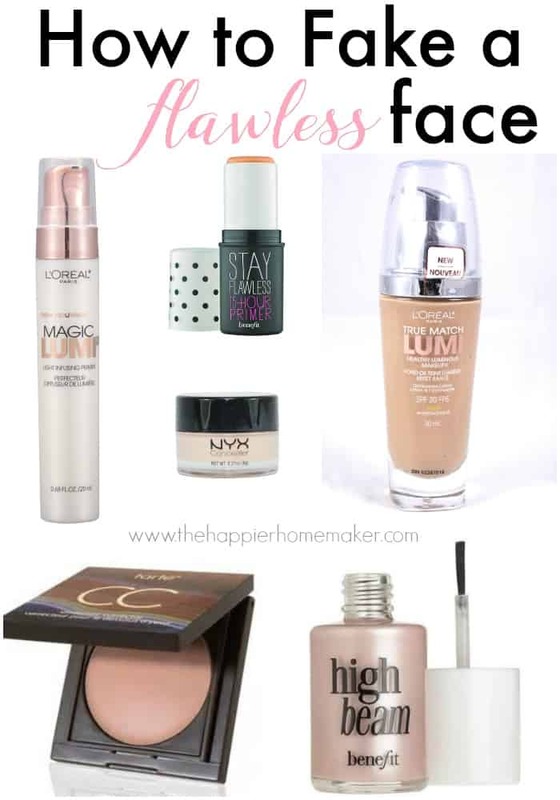 So those are my top picks for faking flawless skin without heavy caked on makeup-do you have a favorite product I’ve missed? 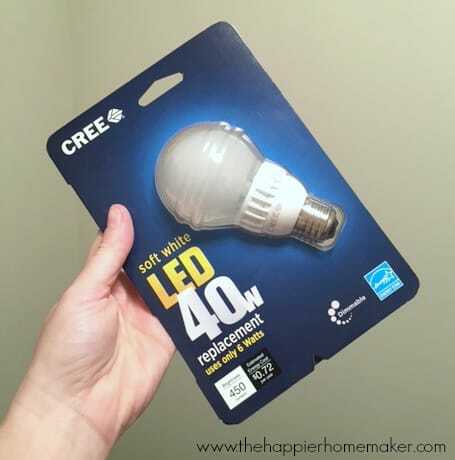 Find out more about Cree LED Bulbs here! Disclosure: I am a brand ambassador for Cree Bulbs, but as always all opinions are my own! « 100 Valentines Day Ideas! previous post: 100 Valentines Day Ideas! It’s difficult to choose a foundation shade as my neck is paler than my face, which is paler than my arms and legs. I’m ombré! My biggest makeup challenge is trying something new! I learned 1 way, years ago, and am afraid that I don’t know enough (and I’m not bold enough) to try something different! You know what they say: makeup washes off. I love to play with makeup on a day when I don’t have anything to do, or a few hours before I shower. This way I’m not risking having to leave the house looking crazy! My biggest makeup challenge is using concealer well. I end up with too much usually, which just draws attention. My biggest makeup challenge is EXACTLY what you talked about here! I want concealment of the flaws without the heavy makeup look. I am thrilled with all your suggestions and plan to try them all. Thanks! My biggest challenge is my rosacea. Thanks for the tips! My biggest makeup challenge is under my eyes — inherited dark circles AND horrible puffiness. Tracy-the Tarte undereye corrector I mentioned in the post is unbelievable for that! I have the same issues and it’s the best thing I’ve ever tried for it! I love using highlighter too to brighten my face. It makes such a difference! Great post with lots of great tips! i have a rosacea challenge too as well as not being young!! (at heart tho!!) I love the idea of the lighting. i have a make-up mirror that doesn’t work as well and doesn’t give enough light. so I purchased a little lamp sit to the side of the mirror and the LED light might make a big difference!! Love some of your products and plan to get the highlighter especially!! s.
My biggest concern is choosing the correct products and shades as I age. What works at one age is so wrong for your skin at the next. My biggest problem is perspiration, I sweat my make off. What do you suggest? You can try this: Mehron Ultrafine Makeup Setting Powder – Neutral/Translucent (0.6 Oz) from Amazon. It helps. Pam-that Benefit Stay Flawless Primer I mentioned in the post is the strongest primer I’ve ever tried-it should keep your makeup in place even with perspiration. The key is to apply it in sections and layering the foundation over it immediately. I would put the primer on my forehead then foundation on forehead, then do one side of my face the same, then the other side. You have to get the foundation on almost immediately for it to “lock” onto the primer but once you master that-it stays on a good 12 hours! Great tips! I love High Beam, too! I have been struggling to find the right foundation also. I have only worn loose powder in the past but now that I’m almost the big 4-0 I need a bit more coverage. Lighting is important because I am so pale I have a hard time finding foundation light enough and under dull lights I can’t see if it doesn’t match! I have crows feet and some crepey eyelid skin and don’t like how makeup settles in the crows feet and makes the crepey eyelid skin look so bad. But I can’t wait to try all of your makeup ideas and products. After having 4 kids and being 53 my skin needs coverage but I don’t like the heavy makeup look. I just replaced my vanity bulbs today ! I used 4 40 watt GE chandelier shape bulbs that are clear. They just seem ok, not great for my makeup , but if I go up a watt, to 60, I think that would be 240 watts and that would be way too much. Sigh. So frustrating. I took out the white spring shaped bulbs which looked to fluorescent and not really good in the bathroom. I need those Cree bulbs. Have read other bloggers say they are great. Funny I am reading your blog the same day this became an issue at our house today! Thanks for this post! This is something I’ve been struggling with lately. Specifically, I’ve had a problem with my skin changing in recent years. I always had porcelain pale skin through high school and college. Now my skin is a bit darker (even though I stay out of the sun) and I’m getting age spots as well. So foundation is something with which I’m ALWAYS struggling. Also, thanks for the lighting tip. I’m hoping to change the lighting fixtures and bulbs in my bathroom soon, but I’ve been on a very tight budget. But I know it’ll be worth the investment once I do! My biggest challenge is covering acne scars. I have had the scars since I had 1 bad breakout as a teenager and can’t find anything to cover! Is it the color or the texture of the scar that’s hard to cover? Or both? I don’t have the pitted scarring that many get but I get red marks left behind after and I usually cover those with that Clay eye concealer I mentioned in the post-it seems to be my best bet for covering anything without that chalky look most concealers seem to have.